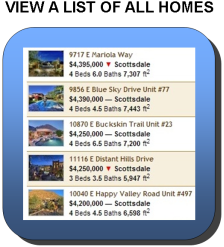 From this page you can easily browse all Verona condos for sale in Scottsdale and Paradise Valley from the Arizona MLS. 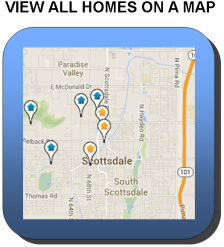 Our real listings are updated daily! Square Footage: 679 sq. ft. - 1,351 sq. ft.
Verona is in close proximity to the McCormick Ranch Golf Club, Starfire Golf Club, Gainey Ranch Golf Club and Camelback Golf Club. 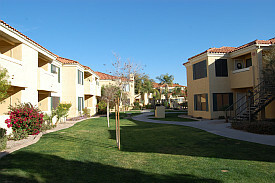 Verona is located in North Scottsdale / Paradise Valley, just south of Shea Blvd and Scottsdale Rd. The subdivison is relatively small with a total of 6 buildings and 108 condominiums. Although originally built in 1994, most units were renovated in 2005 with new interior paint, cabinets, granite-style laminate countertops, 16" tile, carpet, light fixtures and appliances. We love the location and convenience of Verona. The community is very walkable. Just outside the gated entrance is CVS Pharmacy. Safeway grocery and Harkins movie theater are less than a mile away. There's also a wide variety of restaurants nearby, such as California Pizza Kitchen, Macaroni Grill, Jason's Deli, NYPD Pizza, Sozzle Grill, Arby's and more. Verona is served by Chaparral High School which is highly regarded and arguably the most desirable school in Scottsdale. Due to the size of the community, location and low price point, you're usually lucky to find 4-5 Verona condos for sale at any given time. Thinking about selling? Please Contact Us for your complimentary home value estimate, or to schedule a free consultation. Get to know Verona in 52 seconds with our tour uploaded to YouTube in HD. If preferred, check out our Verona photo album located HERE.